After a Montana officer's breakdown went viral, the public started to see the often hidden, emotional aftermath following a shooting on the job. SAN FRANCISCO -- Millions have seen the video on YouTube of a Billings, Montana cop crying on the hood of his car after he shot and killed a man. It's an emotional response you rarely see. Officers ABC7 News spoke with, who have fired their weapons in the line of duty, tell us this kind of trauma happens often after a shooting -- it just happens in private. ABC7 News took an in-depth look at how police cope after a shooting. 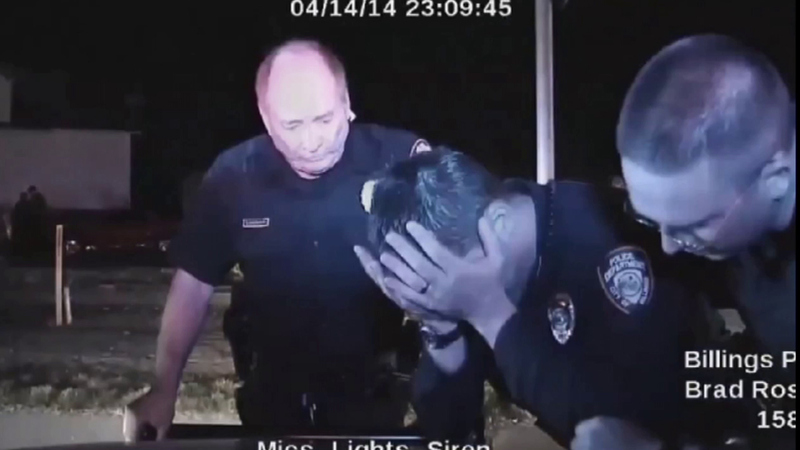 A Montana police officer broke into tears after fatally shooting an unarmed man who was high on methamphetamine during a traffic stop, according to video shown to a jury last week. In Billings, during a vehicle stop, the officer recognizes the man in the back seat as a suspect in a robbery and shooting. He tells the three men in the car to get their hands up. The suspect in the back puts both hands on the head rest, but suddenly his left hand disappears from view. The officer yells for him to keep both hands up. More cops arrive. They cuff the others in the car. And after the officer is told the man he shot had no weapon, you see the instant emotional meltdown. We asked two officers who've been involved in shootings to watch the video. San Francisco Police Association President Sgt. Martin "Marty" Halloran told us, "I had flashbacks of that day back in 2002. It strikes an emotion in anyone, any officer who's been involved in one of those incidents." San Francisco Police Ofc. John Ferrando told us, "We're human beings. We put this uniform on and the general public thinks that we can put everything on a shelf. You know our emotions, our feelings." San Francisco Police psychologist Sgt. Mary Dunnigan said, "I thought his emotion was appropriate, given that he had to take someone's life." Dunnigan counseled many officers who have fired their weapons. What's unique about the video, she says, is that the officer broke down in public. "It's not typical. Most of the time officers will try very hard to stay in control, in public especially, in uniform, at a scene. And sometimes they get a chance to feel vulnerable and break down when they're with their family or spouses," Dunnigan added. "It struck me the next day. When I'm by myself... and yeah, you know, I cried... it was difficult," Halloran said. "It's embedded in me now. It's embedded in my memory, my mind, my brain and I can't forget it if I wanted to forget it." Halloran shot and wounded a man with a gun in 2002. He recalled, "He actually fired upon us first, so this was a deadly threat." However justified, the shooting still haunts Halloran 13 years later. Halloran explained, "You're constantly second-guessing yourself, replaying the incident in your head, wondering if there was another avenue you could have explored, rather than resort to lethal force." Ferrando was involved in an officer-involved shooting seven years ago at the corner of 6th and Mission streets. He remembers, "I ordered him numerous times to drop the gun and that's when he raised the gun in my direction and I... shot back." Ferrando says he was having sleepless nights and feelings of isolation. He told us, "I really didn't understand what was going on, until years later... did I realize what cumulative effects I did have from that incident." San Francisco and most other police departments require officers involved in shootings to go through a critical incident debriefing process. From there, services like peer and trauma counseling. Dunnigan says they need the right support to cope. She told us, "A lot of cops will spiral and their coping then turns into numbing emotions by drinking or substance abuse or checking out and becoming depressed." Both Ferrando and Halloran are involved in helping other cops who've been involved in shootings. Ferrando is active in peer support and Halloran is supportive in his role as head of the police association. "Unfortunately, we were put into that situation and we had to react. I don't know of any police officer that joins any police department looking to go out and shoot a suspect for any reason. That's the last thing we want to do," Halloran said.